Carl Yastrzemski played for the Red Sox from 1961 to 1982, and was an All-Star for 19 seasons. 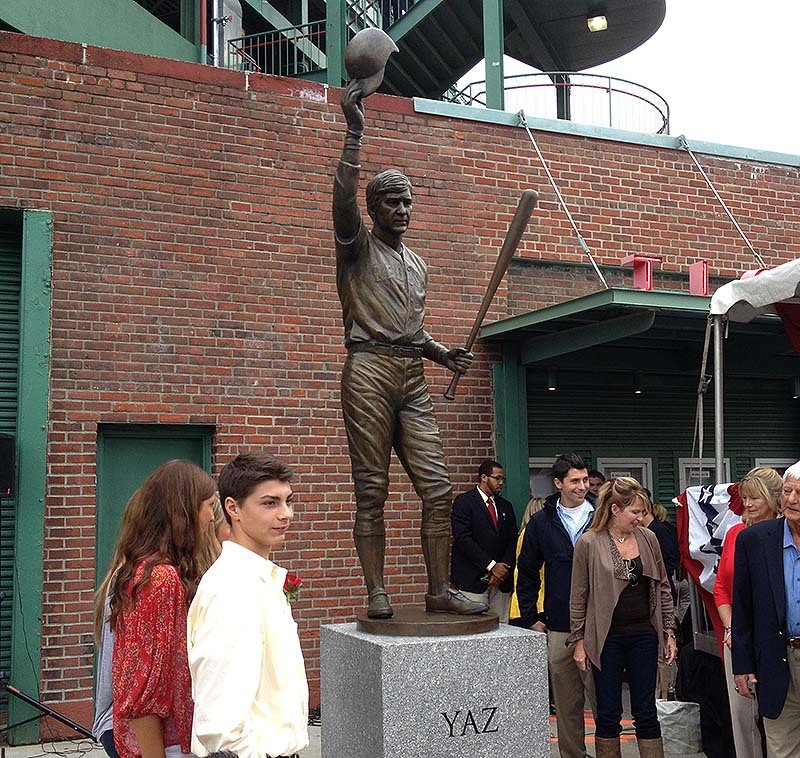 BOSTON — Red Sox Hall of Fame outfielder Carl Yastrzemski was honored Sunday with a statue outside Fenway Park. The statue was unveiled before the Red Sox final regular-season home game Sunday. The ceremony was attended by hundreds of fans, family, former teammates and members of the Red Sox ownership. Manager John Farrell and players Dustin Pedroia, Daniel Nava and Jonny Gomes sat in the front row. After hearing glowing remarks from former teammates Jim Rice and Dwight Evans, Yastrzemski, 74, stepped to the microphone. “I’m deeply honored seeing this statute in front of the place I called home for 23 years,” he said. The statue depicts Yastrzemski during his final at-bat, tipping his hat to the fans. Yastrzemski played for the Red Sox from 1961 to 1983. He played more games than any American League player (3,308) and was named an All-Star for 19 seasons. He finished with 452 home runs.